The Wild West Ranch, a new farm extension in FarmVille will have a buildable building called the RANCH SALOON. It will be one of the major building in the farm and will be upgradable up to 10 stage. For each stage upgrade made will equal to 1 exclusive reward that will be given automatically. 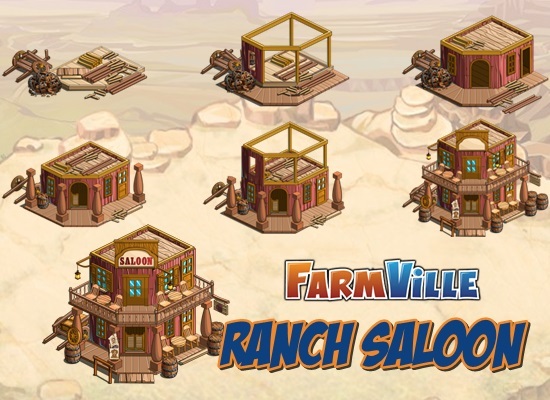 Below is a look of the Ranch Saloon, it’s materials requirements and rewards. Build up Ranch Saloon and reap wonderful rewards! Add parts to Ranch Saloon to improve it and earn Ranch Points! Find a new reward every day! Keep improving Ranch Saloon! You never know what might show up! Here are the materials that we will need to build and upgrade the RANCH SALOON. Each stage will require different amount. As you progress, the number of materials needed will increase.